In seeking safety and productivity innovations to improve efficiency PTAS identified an opportunity to extend access to all as-built switchboard documents. 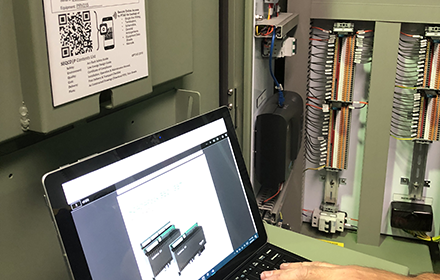 We have developed a unique support system for customers to always have access to as-built drawings, data sheets, safety manuals and much more. Access via secure login or simple QR scan from inside the switchboard. PTAS has develop a unique support portal for customers to always have access to as-built drawings, data sheets, safety manuals and much more. In seeking safety and productivity innovations to improve efficiency PTAS identified an opportunity to extend access to all as-built switchboard documents. 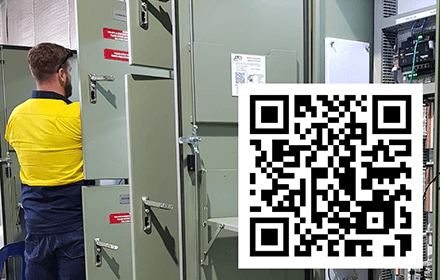 All switchboards are delivered with a QR code that provides backup ‘Installation and Maintenance Manual’ documents hosted on a secure private cloud portal. PTAS has established a separate hosted switchboard data site for customers; a secure unpublished website managing the cloud-based information base. Wayne & Donovan demonstrate how the PTAS QR Online Customer Support System works in this video. Scan this QR code with your mobile device from the screen image to link to our demo test site. Explore the menus to see what the QR Online Customer Support System offers.